I’ve walked dozens of beaches looking for nesting sea turtles in Latin America. I’ve watched these ancient reptiles crawl out of the ocean, make their way up past the high tide line, dig their nests, drop their eggs, and make their way back to the water. This ancient ritual is fascinating to witness and I’ve had the pleasure of helping more than 1,000 people share this experience. But this is not a graceful dance. Out of the water, the turtle struggles to crawl and is slower than the famous tortoise chasing the hare. In the water, freed from the weight of their shell and heavy sand to crawl through, these marine animals are graceful and quick; one powerful thrust of their flippers propel them across the water. To see these animals in their true splendor, one must visit their home and get under the water. Sea turtles have attracted divers to spots around the tropics since Jacques Cousteau first started bringing the underwater world to the surface. They are the highlight of any dive, a major draw for tourists that help to drive coastal economies around the world. Divers dating back to Cousteau have used this inspiration to help protect these animals. Divers organized by Project Aware have helped to clean thousands of pounds of trash from the ocean. They have also helped create marine protected areas and prevent unsustainable development around important reefs. Sea turtles need divers and the dive industry now more than ever. Six of the seven species of sea turtles are threatened or endangered around the world. People continue to eat their eggs and meat in many countries and the sale of souvenirs made from turtleshell, though now illegal in most countries, continues in many places in Latin America, Asia, and elsewhere. The growing threats of climate change and plastic pollution now affect every single turtle on earth. More recent threats directly related to divers are also cropping up. Go Pro cameras on sticks allow divers and snorkelers to take great photos, but can also cause stress in a sea turtle and block its path of escape. Even the sunscreen that divers wear can affect sea life, just a small amount of the chemical oxybenzone (found in many sunscreens) can pollute a reef. SEE Turtles is launching Divers For Turtles as a way to bring more ocean lovers into the effort to protect sea turtles and the ocean. In partnership with dive shops and the dive industry, we will help divers get involved in conservation efforts and improve diving practices. Our new sea turtle ID card will help divers recognize the different species while promoting conservation messages and raising funds for conservation programs. Divers are a key part of the travel industry that keeps up demand for turtleshell products, contributing to the demise of the animals they come to see. 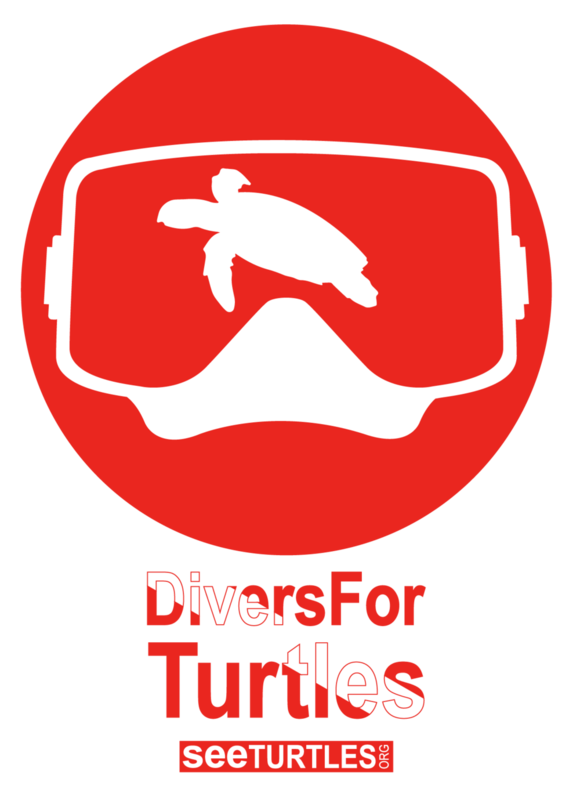 Divers For Turtles will also be a resource for opportunities to volunteer in conservation and research efforts and advocacy to support efforts to protect the ocean. With the support of divers, dive shops, and the dive industry, we can help end the trade in turtleshell products, clean the ocean of plastic waste, and save endangered turtle hatchlings around the world.